I’m a massive SRK fan, and I loved both Main Hoon Na and Om Shanti Om, but given Farah Khan’s last film, I was hopeful but not too excited by the prospect of Happy New Year. 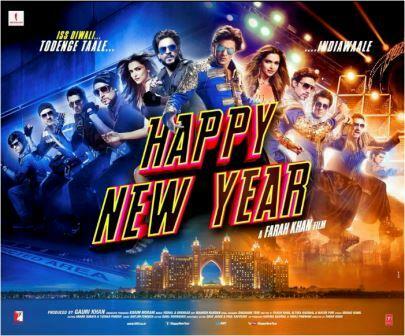 Even after watching the film in a packed cinema, I still have a feeling of ambivalence since overall Happy New Year is a bit of a muddle. The film starts very slowly with painstaking introductions of the characters that are a mixture of brilliantly funny and just plain crass. Then there is the set up for the actual heist – again a mixture of ridiculously mind-numbing cliché and clever, snappy comedy, but at least finally the film seems to be going somewhere. Finally there is the actual heist which is fine, and a feel-good ending, suitably horrendously overacted but very masala, and the best bit of all – the end credits. No, not because it’s the end of an overly long film, but because Farah includes everyone involved (as she always does) and it’s very well done. A mixture and certainly not all bad, but unlike Om Shanti Om, not a film I’m going to rush back to the cinema to watch again although I will definitely get the DVD. Shah Rukh plays Charlie, son of Manohar Sharma (who else but Anupam Kher?) a disgraced safe maker and security expert. Charlie knows that Charan Grover (Jackie Shroff – thankfully fully dressed for the entire film) set his father up and was responsible for the diamond robbery that put his father into prison. It just so happens that Charan Grover will have crores worth of diamonds locked away in his safe in Dubai over Christmas, just when the World Dance Championships are being held in the same hotel. Obviously then, Charlie will just enter the dance competition and make off with the diamonds leaving Charan Grover and his son Vicky (Abhishek Bachchan) to take the blame. If it sounds completely illogical and nonsensical then that’s because it is, but although that’s not a problem for a Bollywood film, here the lack of logic is the whole point and it’s not as funny as it should have been. Farah Khan seems to want to be sure that everyone gets the joke too, because the details of the set up are repeated over and over again. 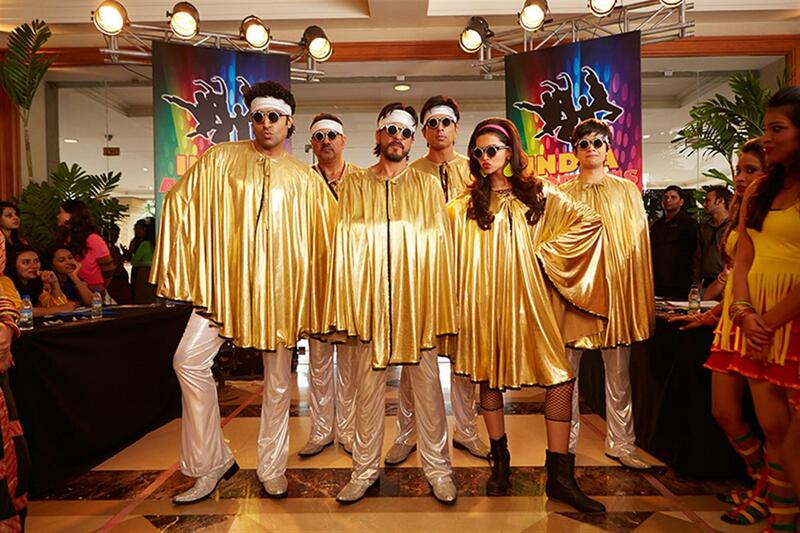 Charlie gets together a team of misfits to help him steal the diamonds including his father’s right hand man Tammy (Boman Irani), explosives expert Jag (Sonu Sood), Grover’s son lookalike Nandu Bhide (Abhishek Bachchan again) and all round loser but expert hacker Rohan Singh (Vivaan Shah). Each has their own quirks and foibles, although my favourite is Tammy’s apparently bottomless bag which really does contain everything. On the other hand Nandu’s frequent projectile vomiting is fairly abhorrent while Jag’s loss of cool when his mother is insulted and Rohan’s general nerdy ineptness fall somewhere in the middle. Needless to say, none of the five can dance which might have been thought to be a pre-requisite to enter a dance competition. Although they have plans to rig the results they still need to get through a judges round and in desperation they turn to a bar dancer Mohini (Deepika Padukone) for help. Strangely for a film about a dance competition the choreography is dull and uninspiring, particularly in Mohini’s introduction number in the bar. Deepika looks stunning, but the song doesn’t showcase her talent well at all, and Farah Khan seems as focused on objectifying the character of Mohini as she is with Shah Rukh Khan’s six pack. Which, by the way, does get plenty of objectification in the opening scenes. And a bit later. As does Sonu Sood’s admirable physique. So much so that unbelievable as it seems it was too much – enough Farah – enough!! The songs by Vishal Shekhar are fine and reasonably catchy but not in the same league as Om Shanti Om. Best of the lot is Manwa Laage which has the best dancing from Deepika, good comedy and (almost) shirtless SRK – perfect! 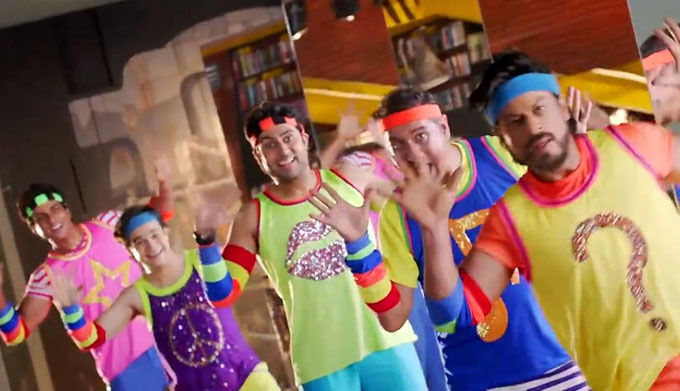 I can understand why the costumes and choreography generally have to be so terrible and OTT for Charlie and Mohini’s group, after all this is a dance troupe that includes Boman Irani, but there doesn’t seem to be any reason why the other dance teams are almost as bad. Particularly once we reach the WDC and the dancers from various nations around the world have tacky costumes and lacklustre routines, making Team India look like a real contender. Think the standard of the dance competition in Disco Dancer but with headdresses and little kids added. There is a ridiculous side plot involving the Korean team but otherwise the film follows Farah’s theme of using older films as a template and adding in as many references to these as possible. Some work, but quite a few fall flat and the many references to previous SRK films are a good example of the later. On the other hand, SRK, Sonu Sood and co. all do a good job with their respective characters and actually manage to make some sense out of the ridiculous dialogue. I love Sonu Sood here is he was funny without being too obvious, while Boman Irani does seem to force the humour a little too much. Vivaan Shah is a little overwhelmed by everyone else but seems fine in a small role, while Jackie Shroff actually adds some class to the proceedings – really! Abhishek Bachchan is good in a comedy role while Deepika absolutely shines and is one of the two lynchpins holding it all together. The other of course is SRK and without him Happy New Year really wouldn’t have had the same impact. Shah Rukh can stand there in the middle of a mud wrestling competition and have buckets of water thrown at him and still look cool. When he switches to over-emotional drama in scenes about his father he can make you believe in his thirst for revenge and when he dances on stage his enthusiasm is captivating. The romance between SRK and Deepika is less convincing but then the real love story is between SRK and his audience so the lack of chemistry doesn’t seem to matter. Happy New Year is a mixture of almost equal parts good and bad. Cutting some of the repetitive scenes discussing the heist and shortening the introductions would certainly have helped, but Farah Khan needs to concentrate more on story development and less on comedy for the sake of comedy, more on structure and less on self-indulgent repackaging of classic Bollywood as crass farce. The problem is partly that when Farah Khan is good, she is very, very good, but when she’s bad she is repetitive and stereotypical in the worst possible way. Happy New Year combines the two and while overall it is entertaining, it should have been so much better. But if what you want is a mindless, colourful and extravagant 3 hours of entertainment, then it fits the bill perfectly. This entry was posted in Bollywood and tagged Abhishek Bachchan, Anupam Kher, Boman Irani, Deepika Padukone, Farah Khan, Jackie Shroff, Shah Rukh Khan, Sonu Sood, Vishal-Shekhar, Vivaan Shah. Bookmark the permalink. Oh, and I was looking forward to an ‘interesting’ Farah Khan after her insipid outing in Tees Maar Khan. 😦 And I must be one of the few people who actually like Abhishek Bachchan. I think he is a good actor, overshadowed by his famous last name. It is a burden few can carry, especially when the father is still going strong. I actually quite like Abhishek too – depends on the role and the director (bit like his wife!). Not so keen on his OTT comedy but I really liked him in Raavan (to think of a more recent movie that didn’t fare so well), and he was great in BAB and Guru. I think it’s always difficult for children to find there own identity when they follow in the footsteps of a famous parent, regardless of the career. So much more so when it’s dome in the full glare of the public eye too. I hope this comes to netflix streaming, because it looks insane, and could be fun to watch with my friends. I couldn’t bring myself to see it in the theater though, because my feelings about SRK are the exact opposite of yours Heather! It’s probably worth seeing for Deepika, who is better than the film deserves, and Abhishek who is mainly good, as long as you can put up with the vomiting! What’s so good about Deepika? It was a fairly ordinary role – she performed it well but why do people keep saying she’s outstanding? My take on this is that Deepika was the only person who seemed to take her role seriously and was actually ‘acting’. Not sure if that is such a big deal but it meant that she less cringe-worthy than the rest of the cast for most of the film. So for me it was a comparison – she was just better than everyone else and more watchable. Why is it important for someone to take their role in a spoof seriously? (I’m not trying to be difficult – would like to know your opinion). It’s definitely not necessary for them to take their role seriously – unless it’s done for the comedy factor, which is then part of the spoof. But in this film, Deepika makes the dumb scenario’s work for her while everyone else is running around looking and behaving like idiots. The other characterisations are just bad – whether anyone in the cast was taking it seriously or not. They could have been and it would have been impossible to know! I’m sure that the actors tried their best but it was all too stupid. So perhaps it was down to the character more than the actor. She had a more serious (relatively speaking!) role that developed in a (slightly) more plausible manner. Have you seen the film? What did you think of Deepika? I completely agree! I’m not even sure this manages to make the grade as a spoof. 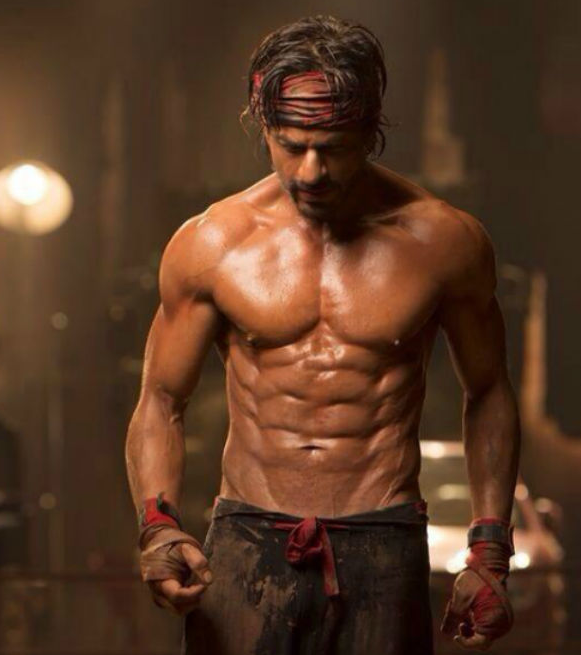 SRK flexing (with some shirtless Sonu Sood added in for the younger audience) and a few tawdry jokes is not enough as the basis for an entire film. Farah missed the mark with this one. I don’t think I’ll be rushing to the cinema for the next one (if there is another) – this was such a disappointment!